Santa Claus is real. Here's proof! I may be Santa's Grumpy Elf, but that question always makes me grumpier. Why do people keep asking? There's even websites that say Santa is not real! Ok, ok, so is Santa real? The short answer, in every way that matters, is YES, Santa Claus is real! Not only is Santa true, he is legendary! And if you still don't believe me, here are NINE proofs to prove that point like the point on my pointy shoes! Mrs. Claus would be mad! There is no Santa greater than Santa! You can't prove Santa doesn't exist! Well, you can see Santa Claus is real right here in this photo, but keep reading for more proofs that Santa exists! Whether or not you believe in Santa Claus, Santa’s touch is felt around the world each Christmas. He even seems to get more popular and be in more places every year! If he wasn’t real, how could he do that? If Santa wasn’t real, then, oh boy, would Mrs. Claus be mad! After all, who has she been married to all this time? Santa is the greatest gift-giver you can imagine. Even people who don’t believe in Santa agree that he is the greatest gift-giver they’ve heard about. But if you can imagine Santa is the greatest gift-giver, then he must be real. Otherwise, there would be an even more famous gift-giver that everyone knows about. But there isn’t a gift-giver better than Santa. So Santa must be real! If someone says Santa isn’t real to you, ask them to prove it! They can’t! Sure they might come up with all kinds of scientific questions to which you might not know the answer. How could Santa do this? and How could Santa do that? . But knowing all the answers to all their questions isn’t important. It still doesn’t mean Santa doesn’t exist. After all, there are billions of places in the universe and they don’t know what exists on any of them except for a very few here. Have they even been to the North Pole for example? Science cannot prove certain things, like Santa doesn’t exist. People can only draw conclusions on what they find, not on what they can't find. On September 21, 1897, The New York Sun newspaper answered a question from a little girl. Virginia O’Hanlon asked Some of my little friends say there is no Santa Claus. Papa says, If you see it in The Sun, it’s so. Please tell me the truth, is there a Santa Claus? . You can read what was in the newspaper here. This is how the newspaper replied: Yes, Virginia, there is a Santa Claus. He exists as certainly as love and generosity and devotion exist, and you know that they abound and give to your life its highest beauty and joy... No Santa Claus! Thank God! He lives and lives forever. A thousand years from now, Virginia, nay 10 times 10,000 years from now, he will continue to make glad the heart of childhood . Well, it must be true if it was in The New York Sun! You know there are many people around you who love you very much. But you know that adults don’t have time to make or get all those presents. They are always so busy! Even then, they wouldn’t have enough money to buy all those presents. Some of them are very expensive after all. Haven’t you ever heard an adult say That costs too much or We can’t afford that ? Ockham’s razor just means simpler answers are better. And what could be a simpler answer than Santa delivering all those presents? Does somebody think that Martians do it instead? Or maybe that parents do it? Can you imagine all the parents in the world staying up all night pretending to be something they’re not? The simple answer is that it is Santa being Santa; not millions of parents being Santa! Even if you aren't sure about Santa, there is something you should know. (He told me this himself.) Everything and everyone changes. What you believe now, you may not believe tomorrow, or you may believe again in the future. The most important thing is that you keep the spirit of Santa in your heart. Just like you keep your love for those who are special to you in your heart. So long as he is in your heart, he will exist in the most important place of all! If you still aren't sure about Santa, why don't you just ask him yourself? 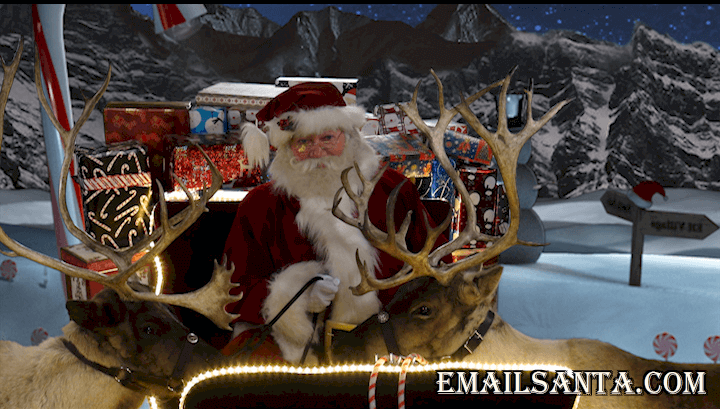 Send him an email at emailSanta.com. At the end there's a place where you can ask him if he is real. I know Santa and I'm sure he'll answer your question. Tweet that Santa Is Real!